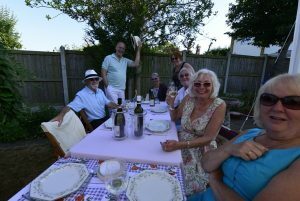 On 13th July the Town Mayor attended Maldon Court School Prizegiving followed by the Maldon Twinning Association summer barbecue in the evening. On 16th she accompanied the Anglia in Bloom judges as they toured the town. The judges admired the floral displays and were also very interested in the information supplied by Plume Academy students regarding their horticultural project. The 17th saw the Town Mayor back at the Plume Academy for the Academic Prize Presentation evening where a former student, Esmee Gummer, gave an inspiring presentation on how she has overcome a potentially life-changing medical condition. On the 18th the Town Mayor attended the Essex County Scout Council AGM and on 20th she was at the Maldon Art Club Summer Annual Open Art Exhibition in the D’Arcy Room of all Saints Church.